I thought I’d share with you a little trick I picked up on the interwebs… I think it was from R0bin’s blog, A Little Sewing on the Side. She interlined her winter coat with hymo and to reduce bulk at the darts, she cut the excess fabric from the dart of her fashion fabric after sewing the dart, and she just cut the hymo on the dart legs before sewing it to the fashion fabric. Et voilá! So while I forgot to cut the excess fabric from the dart of my fashion fabric, I did remember to cut the dart legs on my interfacing. So when I was ready to fuse, I just brought the sides of the dart on the interfacing together as if it was sewn and fused it to the fabric that way. It worked like a charm. 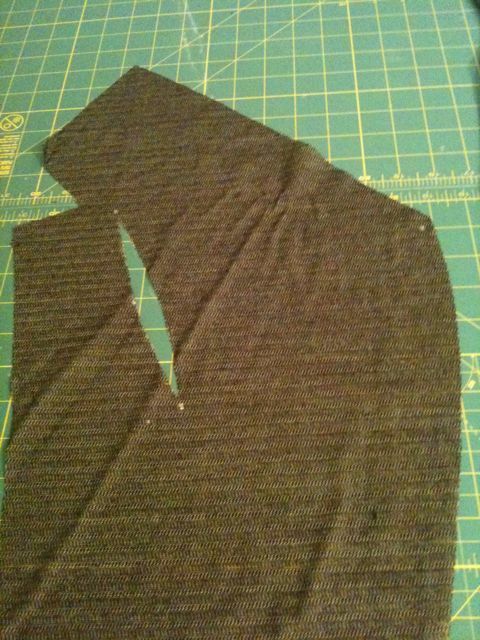 See the picture below for how I cut out my interfacing. Using the pattern pieces, I just lifted up the edges of the pieces to cut inside the cutting line so that each interfacing piece would be slightly smaller than the fabric piece. That way, I would reduce bulk and reduce the chances of fusing my ironing board! 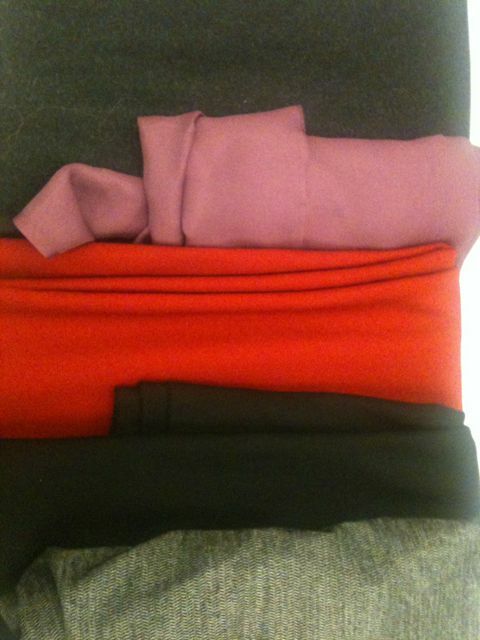 And here’s all my pieces (minus the sleeves) interfaced and ready to be sewn. Now isn’t that a pretty picture??? So, as I mentioned before, I had a lot of time to sew yesterday. I completed the outer shell construction during the day and last night I made the tie belt. I did a lot of top stitching. A. LOT. I love it. On Carolyn’s recommendation, I used the special topstitching stitch on my Emerald 183 (remember, I am not using my “new” Singer Featherweight 221 yet until I get the kinks figured out). I love this stitch! Basically, it’s a straight stitch that’s slightly longer and is sewn twice, side by side, so that it’s slightly wider and longer looking, making for a beautiful topstitch. I practiced different ways to topstitch on scraps before I actually did it on my coat. BTW, I highly recommend that; I always practice my stitches for every new piece of fabric I sew. That way there’s no nasty surprises during construction. I tried two threads through the needle with an even longer stitch, but the stitches weren’t consistent. My only wish for the special topstitching stitch would be the option to make it longer than 3.0 which is the max length setting on my machine. I think the topstitching would look even better at 3.5. But I still love the way my topstitching looks now, so I’m a happy camper. 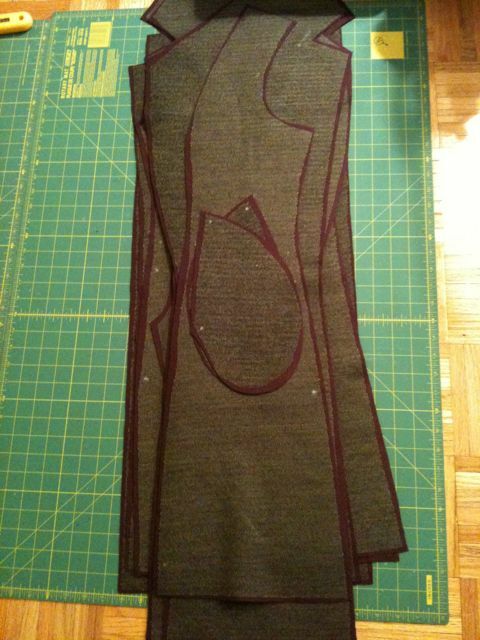 So tonight, I will fuse my sleeves, re-cut my lining back pieces (remember the dreaded grease ring?) and continue constructing my coat. By my calculations (time you think it will take you to finish x 3 = actual time to finish), I might be able to finish this coat by Weds night. That is, if I put in three solid evenings of at least 4 hours of sewing time each night. Remember, I’m a slow sewist. 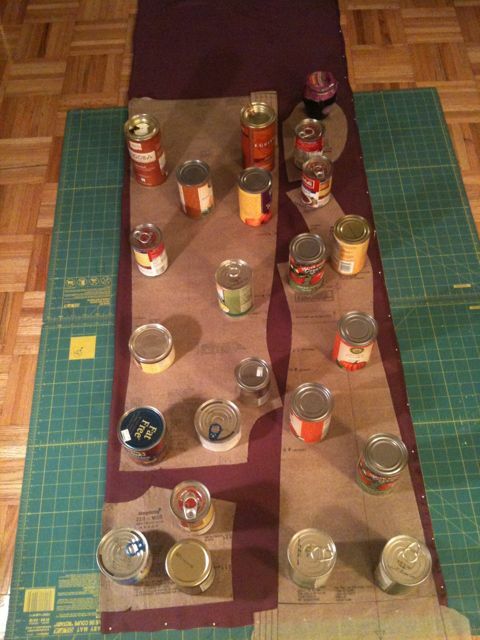 This entry was posted in Coats, Sew Alongs, Sewing, Trench Along. Bookmark the permalink. All the pieces cut out and interfaced is a lovely sight! Can’t wait to see your finished coat. You are making great progress on your coat and agree that is a pretty picture of all those interfaced pieces…lol. Wow, four hours of sewing a night! What time do you go to bed? What time does Jack go to bed? I am very lucky if I get in two hours a night. At the most usually it’s 1.5 hrs. Yes, I can’t wait to see it either. This is exciting! Wow, I’m glad you get that much sewing at a stretch! Can’t wait to see your coat. Very nicely done. I have a question(s) – I have never done any piece that required large blocks of interfacing, though I have used underlining with another fabric to support the fashion fabric. How does the block interfacing change your jacket – does it give it more of the feel of the garment that you are looking for? Does it change the fabric substantially? Do you find that a good thing or a negative? How do you know when to do fusible block interfacing? And what did sewists do before fusibles? I have wanted to ask that question(s) for awhile – it seemed to fit here. Your coat is looking SO GOOD! I really like your dark plum shade. That is such a pretty color and girls with dark hair, in my opinion. My coat got completely sidetracked when I started a sewing class at community college and had to make a skirt, but I swear I’m getting to it next! lol! Nice progress! I have yet to cut out all my pieces for the lady grey coat… hopefully I’ll get them cut by the end of the week… I can’t wait to see your finished coat! I did interface the entire coat. I wanted to give the fashion fabric a little more weight. Not as an interlining though, more as a change to the hand of the coat. I thought of using a heavier interfacing for the lapels of the coat, but thought the double layer (double due to under- and upper-collar) would be enough oomph in the end.